This article is for the 5★ version of Ryougi Shiki. 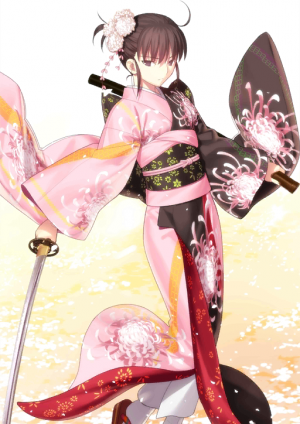 For the 4★ version, see Ryougi Shiki (Assassin). Available for summoning during the Garden of Order event. Deals heavy DEF-ignoring damage to all enemies. Overcharge: Chance to inflict Death to all enemies. When equipped on Ryougi Shiki (Saber), Increase Arts Card performance of all allies by 15% while on the field. A woman seen in the Irregular Singularity, Boundary Formula. 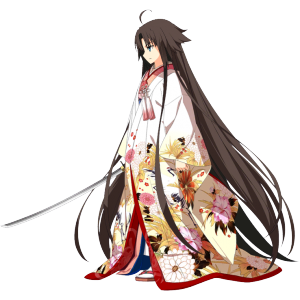 Clad in a luxurious kimono, her gestures are graceful and her judgment is merciful. All are considered to be significantly normal in an abnormal world. As her existence itself is uncertain, despite knowing about numerous bizarre incidents, she takes no part in them. A woman you'd never meet under normal circumstances. Even so... if an encounter were at all possible, it would be on a snowy night, after everyone had gone to sleep. Unfortunately, her cat attributes have decreased. The same "Ryougi Shiki" as the one wearing a leather jacket. However, her personality is different. If Ryougi Shiki is a girl named "Shiki," then this person is a woman named "Ryougi Shiki." Her origin can be traced back to way before the Ryougi family, the personality of the body that manifested [ ]. She is not an entity that should roam this world freely, so she will be asleep inside of Shiki from her birth to death. 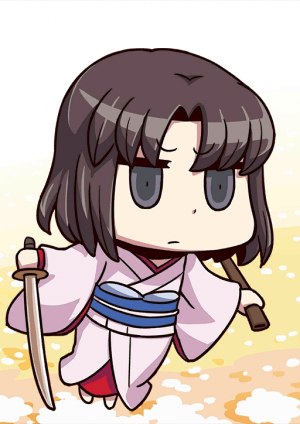 "Ryougi Shiki" will never be known to Shiki, nor can "Ryougi Shiki" ever replace Shiki. The coils of Yin and Yang. If you wish to learn this, discard this at once. If you wish to save this, forget this at once. Yearning and regret are two sides of the same coin. Just like life and death. Here, Shiki restores her HP in exchange of NP. By applying the Mystic Eye of Death Perception, she can see the "lines of death" of all her enemies and sever them in a single strike. Her sword from beyond the afterlife, shall bring forth a peaceful end to all existence. This was born of [ ] and shall one day reach [ ]. Separate the two polarities circling the four symbols, and assemble the eight diagrams. Her existence is the manifestation of the world's principles. Ryougi means yin and yang in Taichi, "Shiki" is derived from the mathematical formulas and the "shikigami." In other words, the same qualities of the omnipotent wish granter itself. Normal parameters will become meaningless to those in possession of this skill. Filled with ennui, yet peaceful. Though she knows everything, she never makes meaningful conversation and is an invincible lady who enjoys pointless chatter more than anything. Though she is extremely feminine and mature, her existence is similar to that of a girl. A mere phantom, she never leaves any meaningful memories, so that when you awaken from the dream, and leave her behind, there will be no sorrow. The woman who was glimpsed at the irregular Singularity, the Boundary. All of these define the "everyday life" even in abnormal situations. Because her existence itself is uncertain, she stays uninvolved in numerous bizarre incidents even while knowing about their full stories. A distinguished individual that normally can't be encountered. It would be on a snowy day when everyone is asleep. 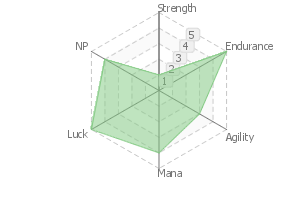 Unfortunately, her cat attribute has slightly decreased. 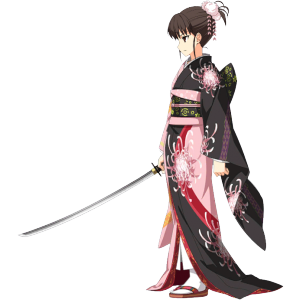 The same person as the girl who wears a leather jacket over a kimono, Ryougi Shiki. However, she has a different personality. 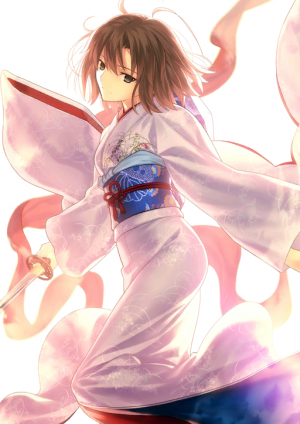 If Ryougi Shiki is a girl with the name, 「Shiki」, this individual is a woman with the name, 「Ryougi Shiki」. The personality of the body itself, embodying 「　」 that represents the beginning. She slumbers within Shiki from her birth to her death. Shiki can't perceive「Ryougi Shiki」, and 「Ryougi Shiki」 will never take Shiki's place. Raden of Yin and Yang. In order to remember an existence, one must abandon the existence. In order to save an existence, one must forget the existence. Longing and return are two sides of the same coin. Paradox Spiral. This Shiki recovers HP by losing NP. Using the theory of the Mystic Eyes of Death Perception, this attack severs the opponents' lines of death. The sword stroke of the afterlife released from nirvana bestows peace to all existence. All existence originates from 「　」 and follows 「　」. Separating the Ryougi, rotating the four phenomena, and assembling the eight trigrams. Revealing the Truth of the world. The Ryougi is the yin-yang of the Taijitu. 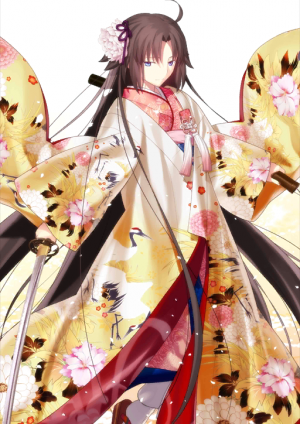 Her name comes from the "shiki" of suushiki and the "shiki" of shikigami. In other words, the mark of an all-powerful wish machine. For those who possess this Skill, regular parameters become meaningless. An invincible "older sister" character. Even while being omniscient, she enjoys meaningless chatter over meaningful dialogues. She may seem like a very womanly individual, but her true nature is that of a girl. Being a mere illusion, she will leave no trace of herself in your memories once you wake up from your dream in order to save you from the grief. 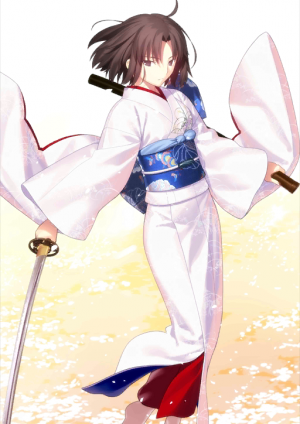 Ryougi Shiki is the protagonist of TYPE-MOON's early light novel series Kara no Kyoukai. She has also made cameo appearances in Melty Blood and Fate/EXTRA. Based on the Fate/Ace Royal card game, Ryougi Shiki can also be summoned in the Berserker class. 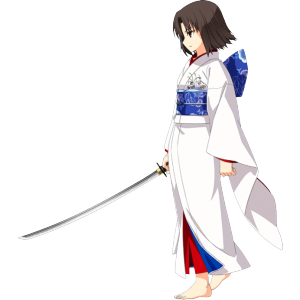 Saber Shiki's stage 2 outfit is from the TYPE-MOON Fes. 10th Anniversary Event. She also wore the outfit at a party in Mirai Fukuin. This page was last modified on 12 April 2018, at 16:27.